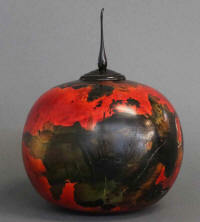 Any piece listed on this page can be purchased as a work of art displayed on a fireplace mantle or coffee table. 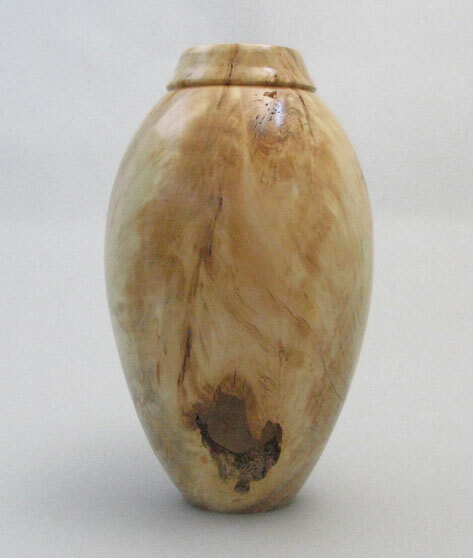 Lidded hollow forms, with volume or capacity mentioned, can also double as a burial urn. 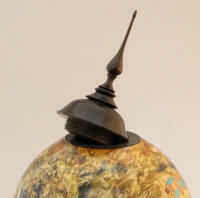 These pieces have a hand-threaded African Black Wood lid and finial. 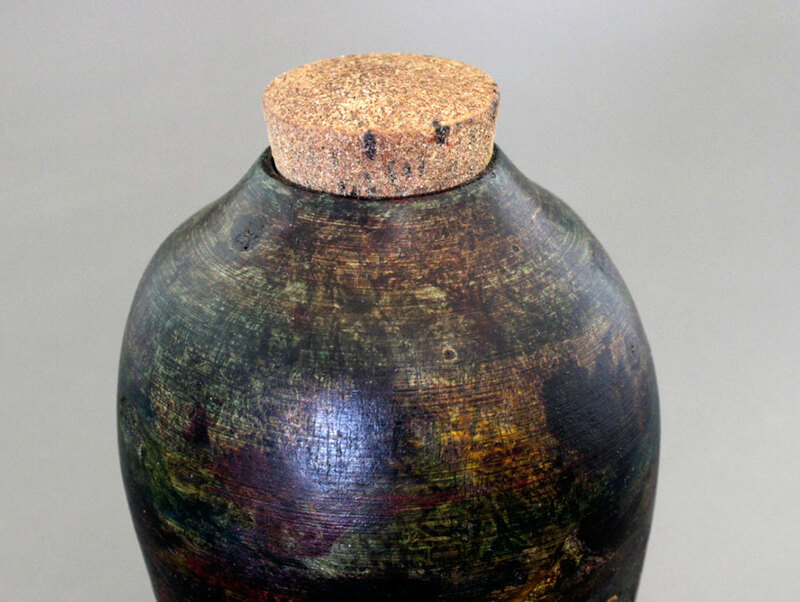 Burial Urn volume: One pound of body weight will yield slightly less than one cubic inch of ash. 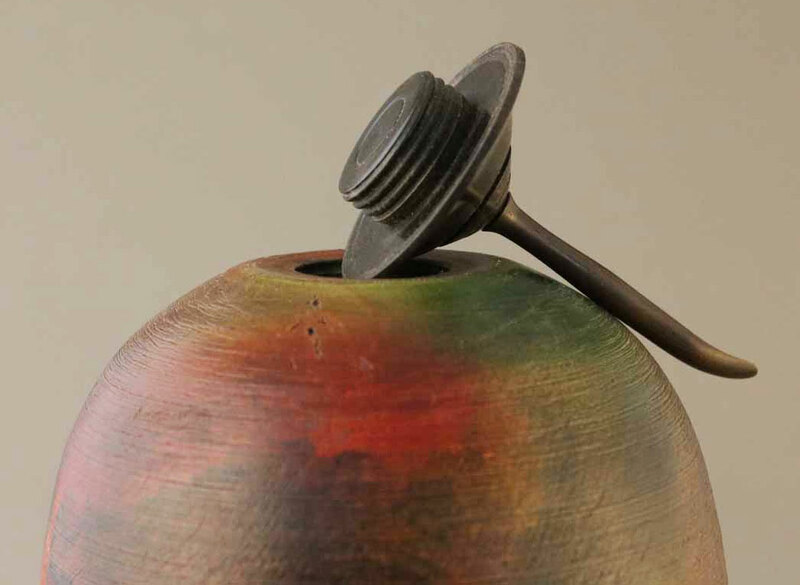 The “capacity” I list is the measured volume in cubic inches. 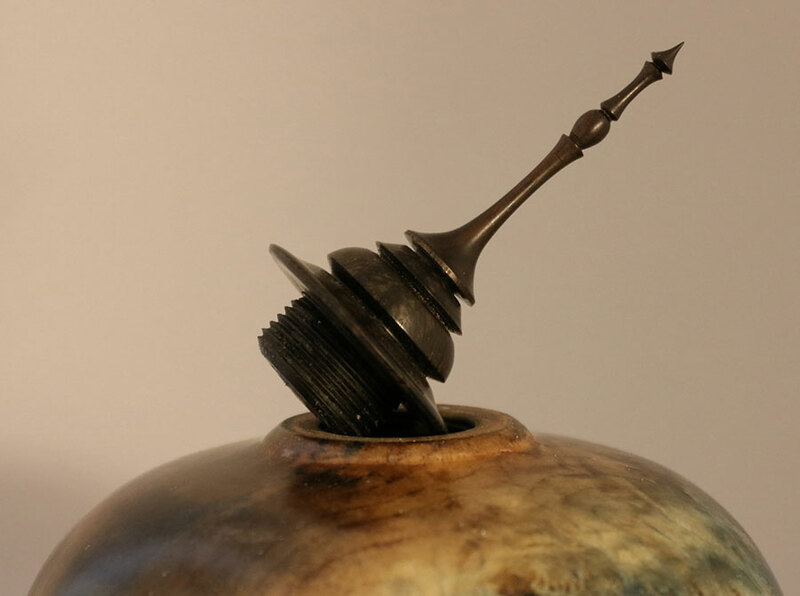 Hollow form with threaded blackwood finial. 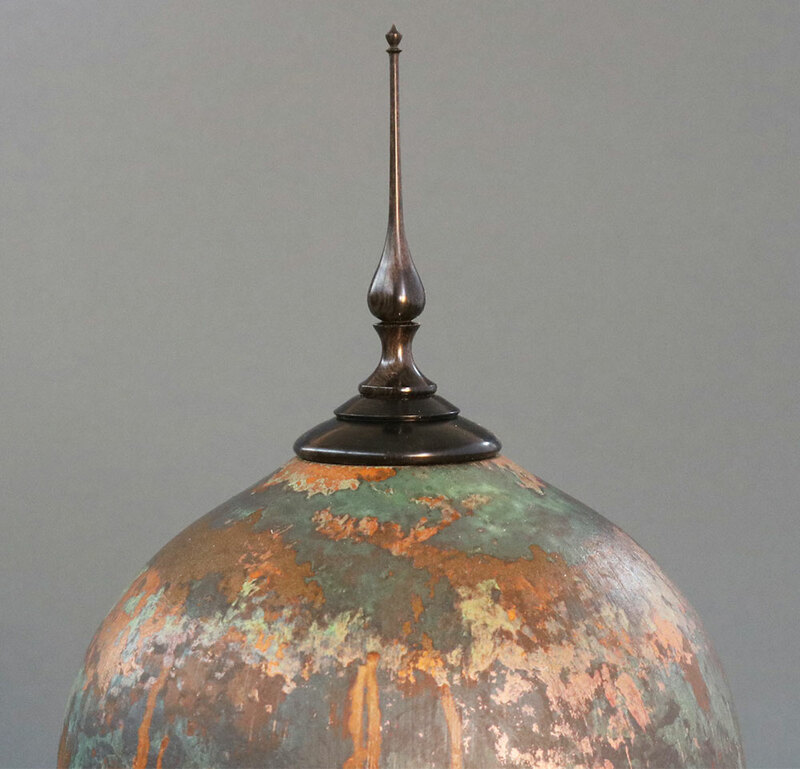 Verday paint is “metal reactive.” After an initial base coat is applied a solution is sprayed on to the surface creating a faux metal patina. This piece is suitable for use as a burial urn. Volume is 120 Cubic Inches. 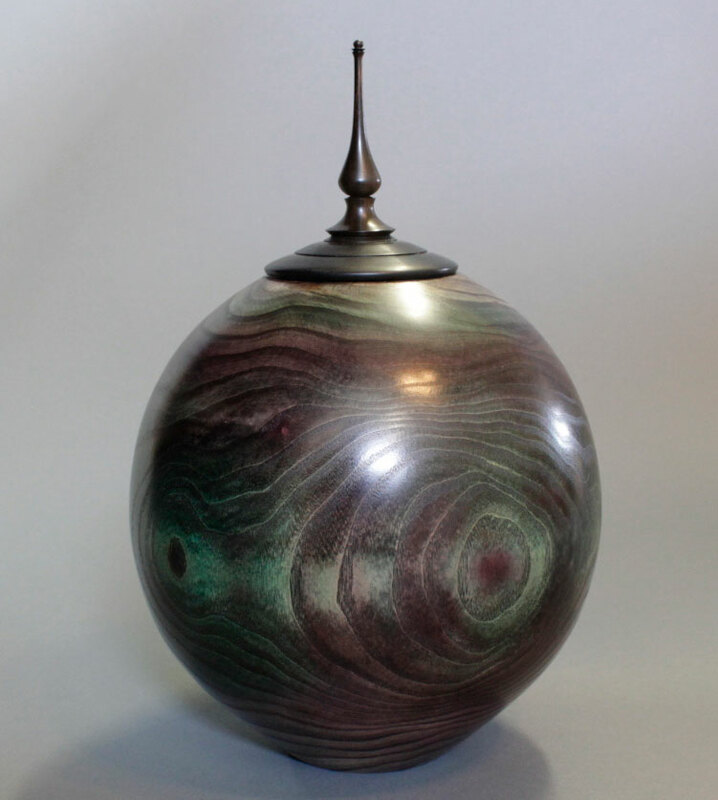 8 inch tall Hollow Form with threaded blackwood finial. 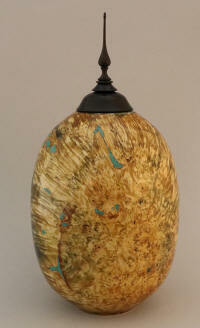 This piece is made from Box Elder Burl and has been colored and a lacquer finish has been applied. 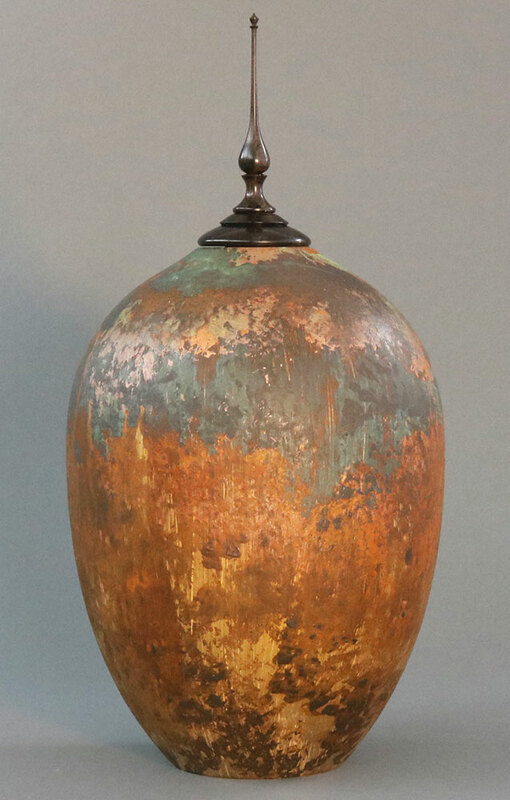 It is suitable for use as a burial urn-volume 70-80 Cubic Inches. Low profile Box Elder Burl hollow form with threaded Blackwood finial: This exquisite burl wood hollow form has been colored and a Tung oil finish has been applied. 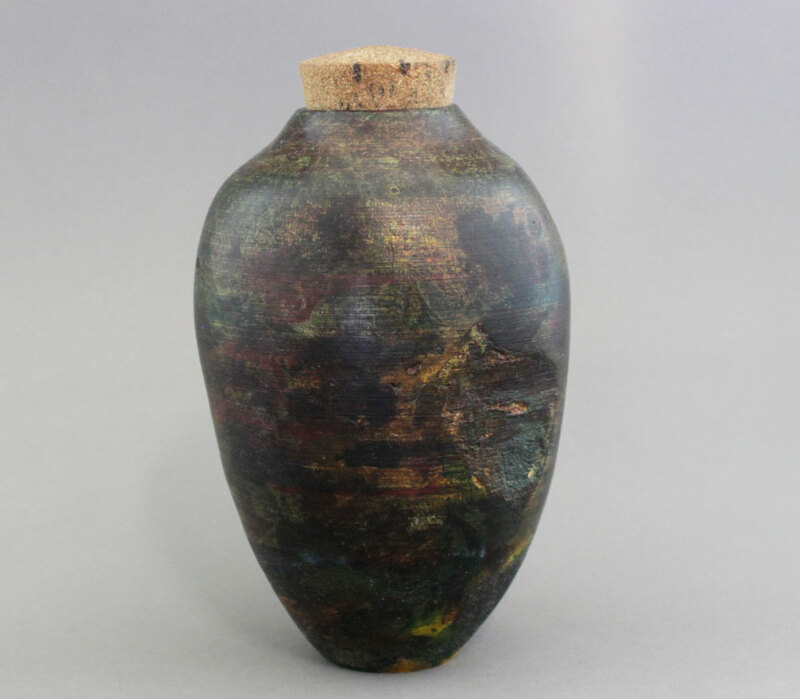 It is 6 ½” tall and 6” wide It is suitable for use as a burial urn-volume 40-50 Cubic Inches. This piece is suitable for a burial urn with a volume of 200-210 cubic inches. 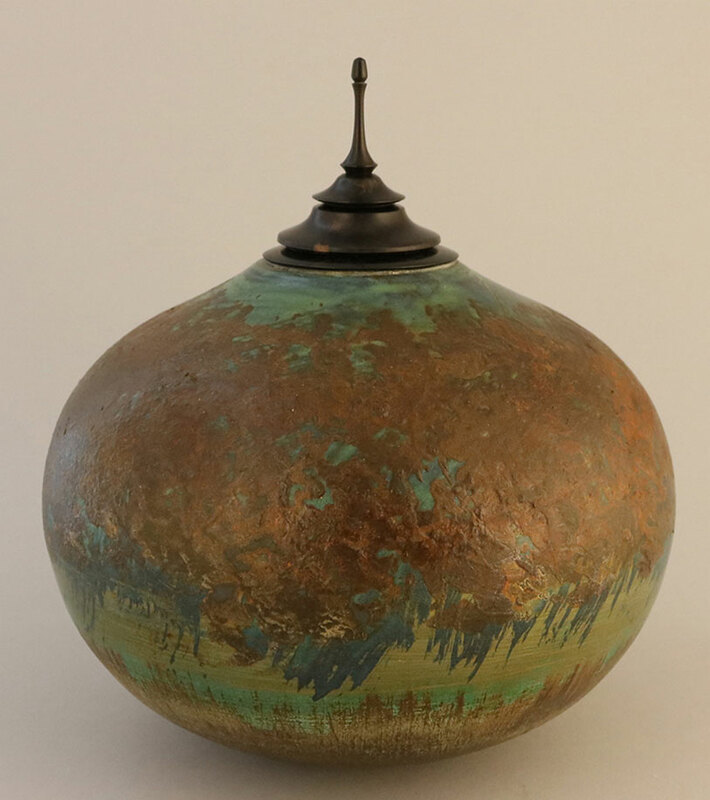 The lid is threaded into the vessel. 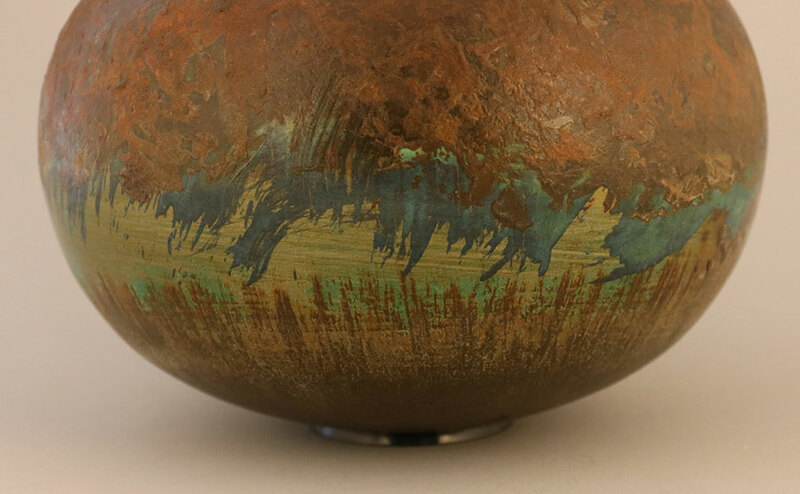 some flaws that add to its character. 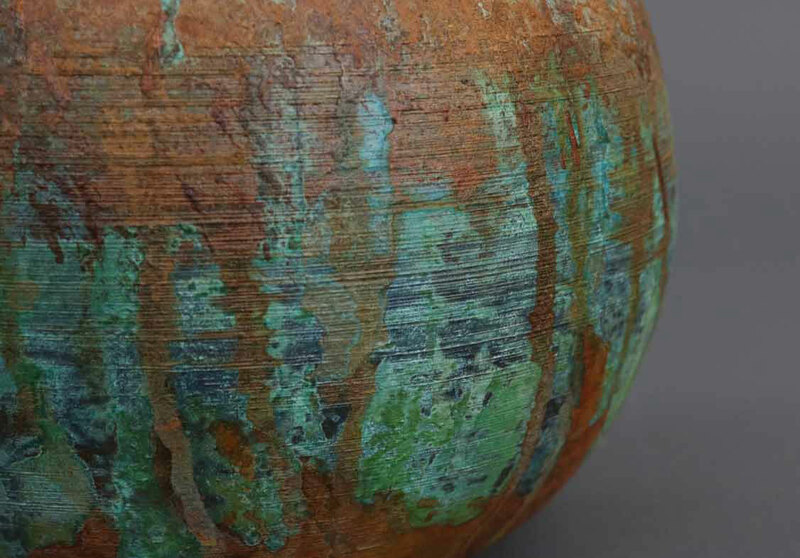 (Any defects are completely sealed from the surface to the interior of the vessel). This piece would also make a beautiful display item. 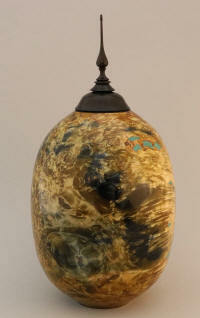 This piece is suitable for a burial urn with a volume of 350 cubic inches. 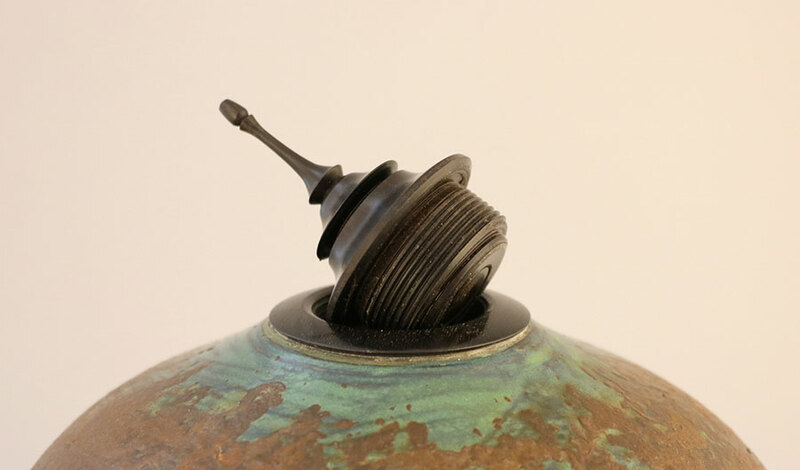 The lid is threaded into the vessel. 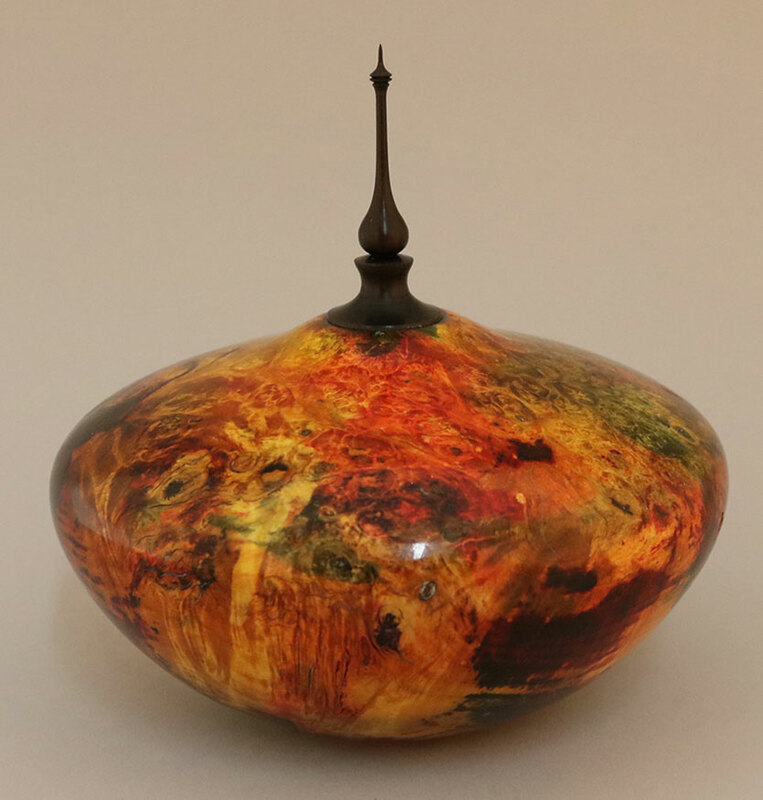 This piece would also make a beautiful display item. 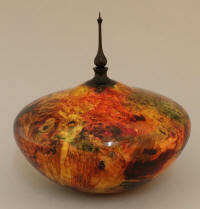 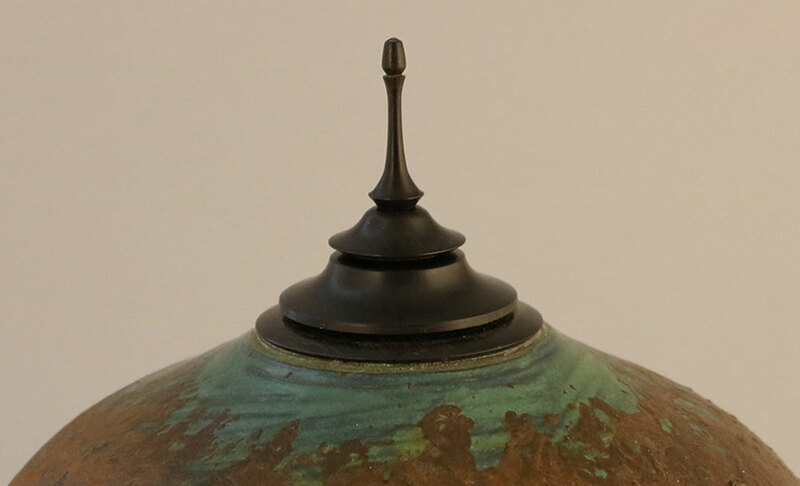 9 ¼ inches tall to the tip of the blackwood finial. 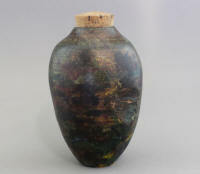 The wood is box elder that has been dyed red and blue. 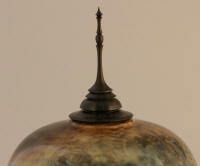 The finial has been turned and carved and the base has been threaded into the hollow form. 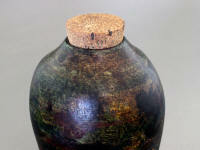 It is suitable for a burial urn. 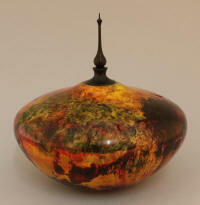 The volume is 55-60 cubic inches Please call if you have any questions cell, 307-431-5395. 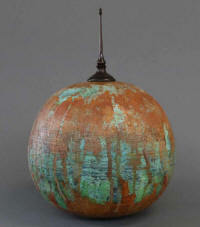 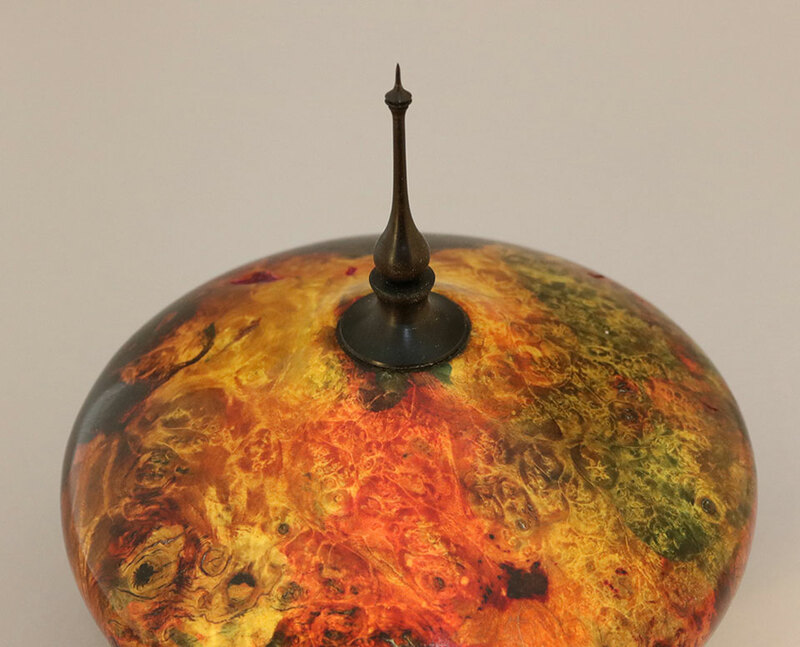 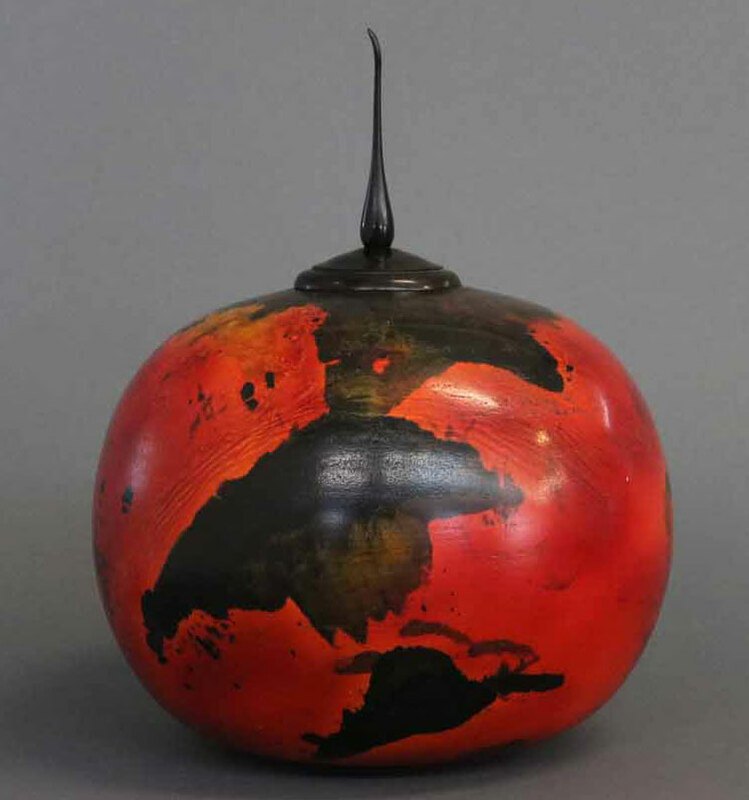 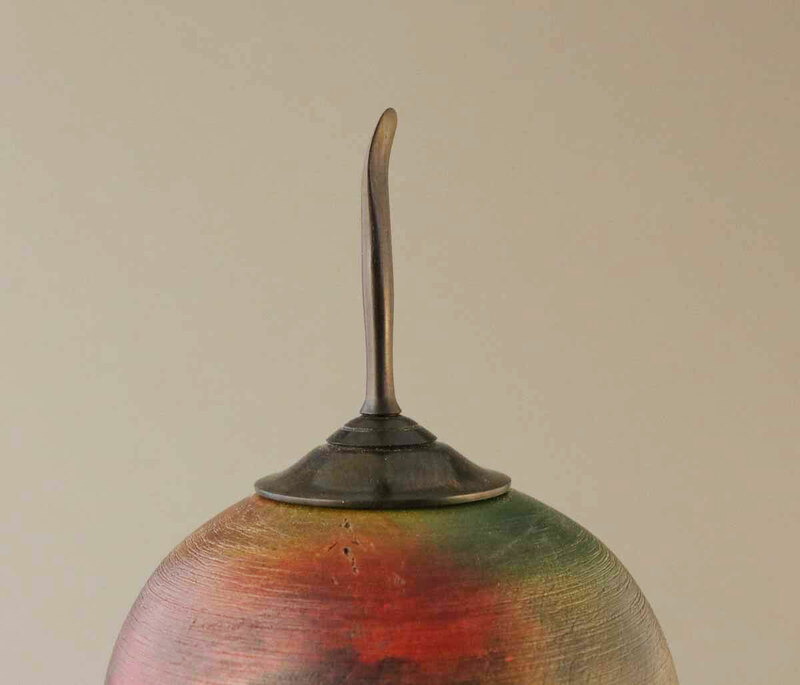 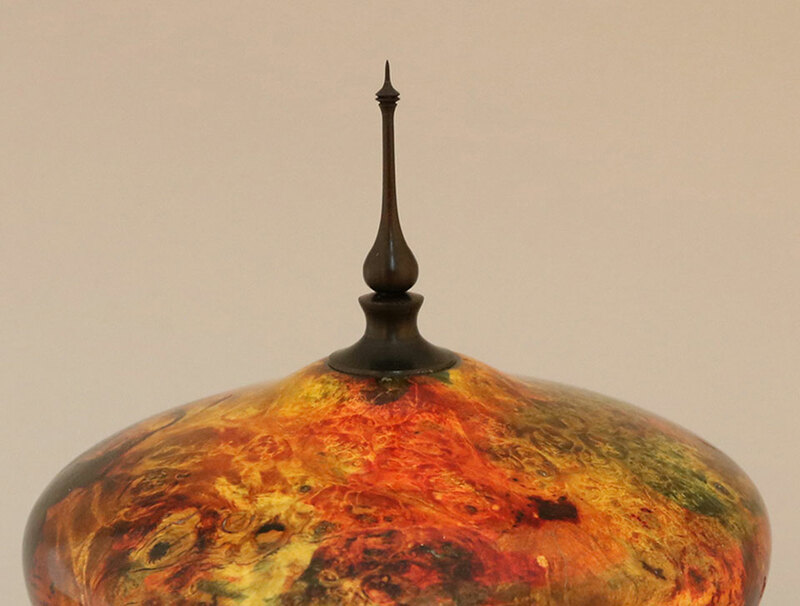 This cherry vessel has a layered patina of metal reactive paint. 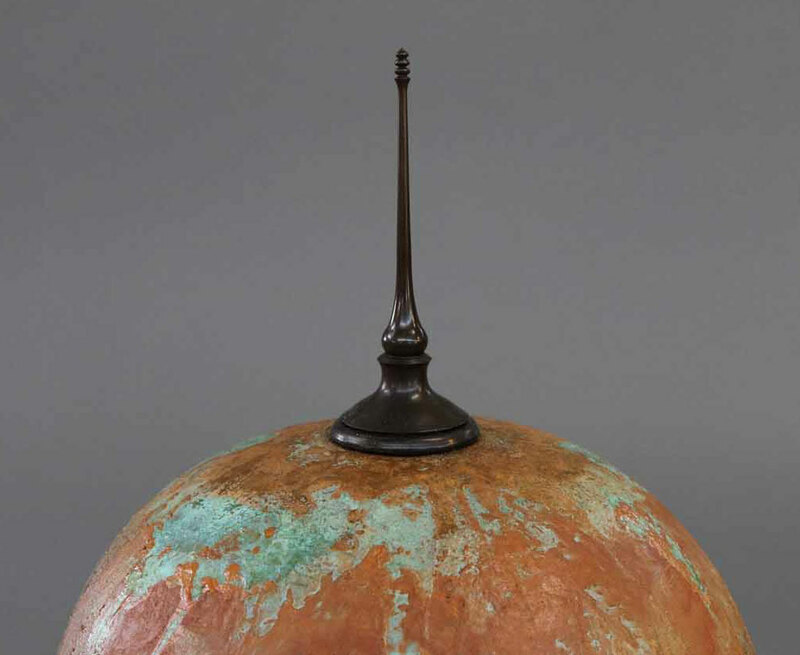 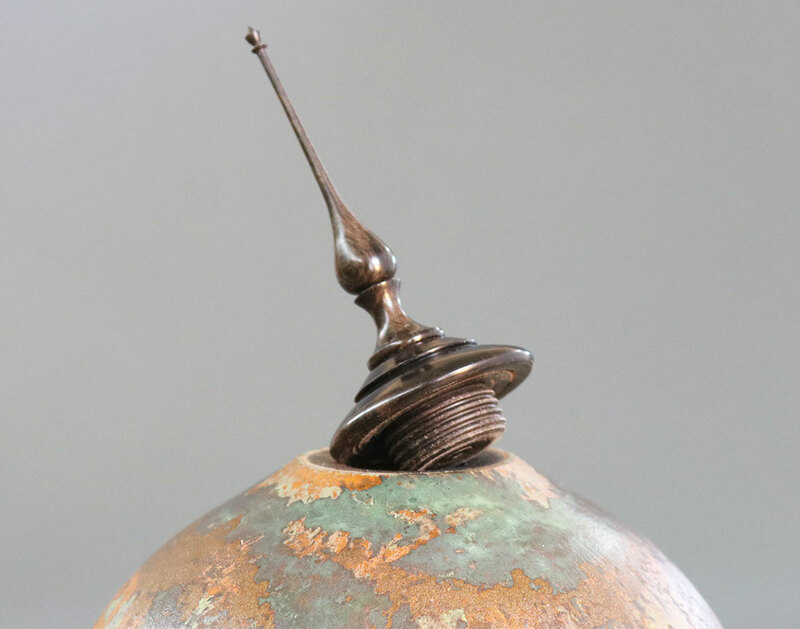 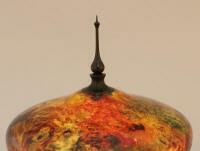 It is 12 ¼ inch to the top of the Blackwood finial. 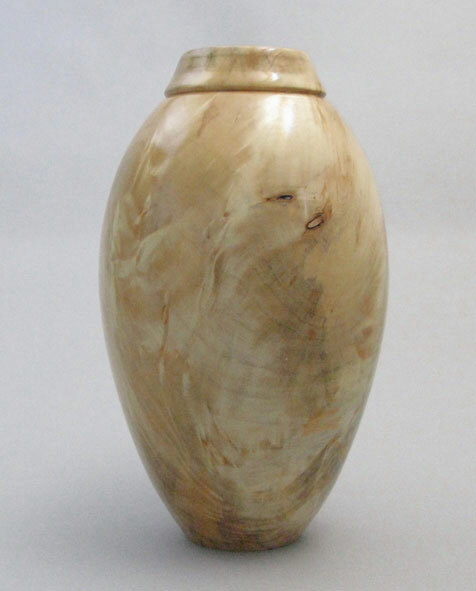 This piece is suitable for a burial urn. 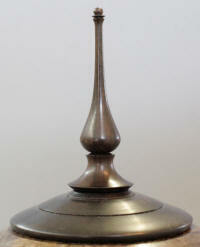 Volume is 140 cubic inches. 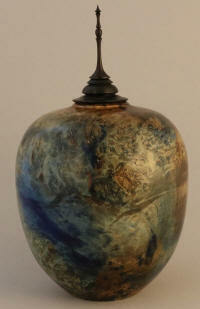 10 1/2 “ tall-to finial, 7” wide. 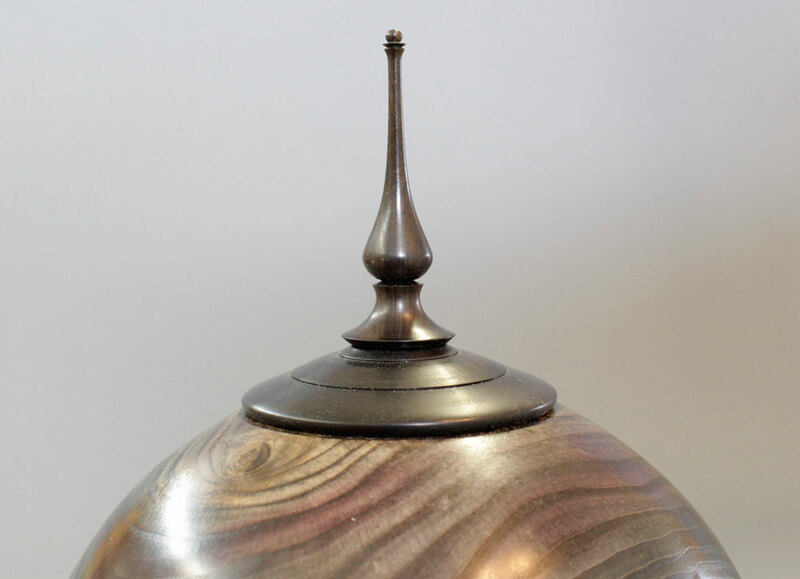 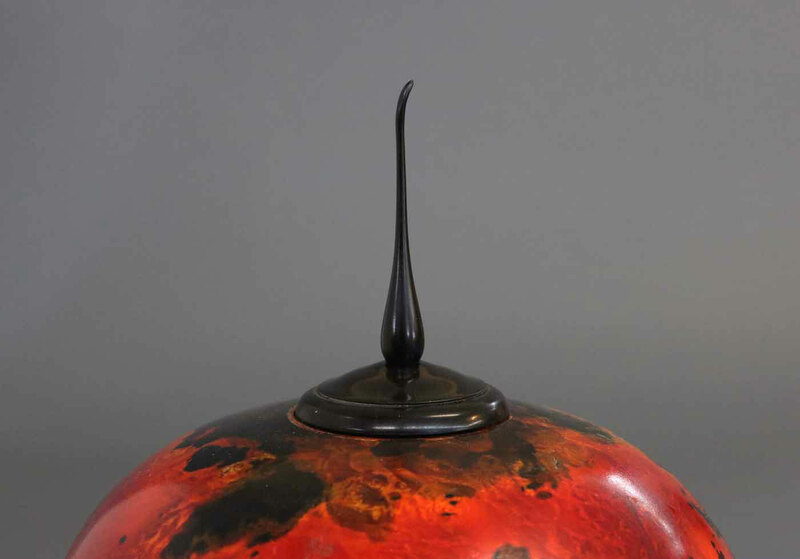 Threaded blackwood finial and lid. 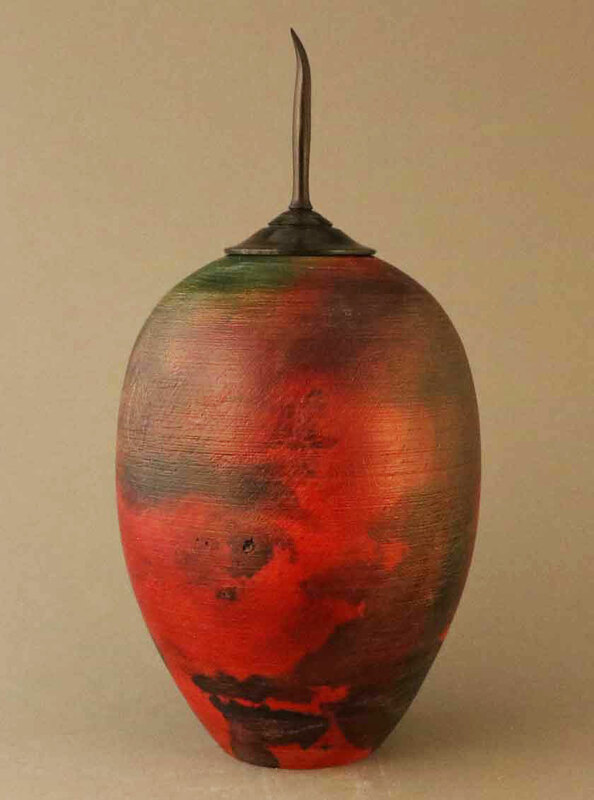 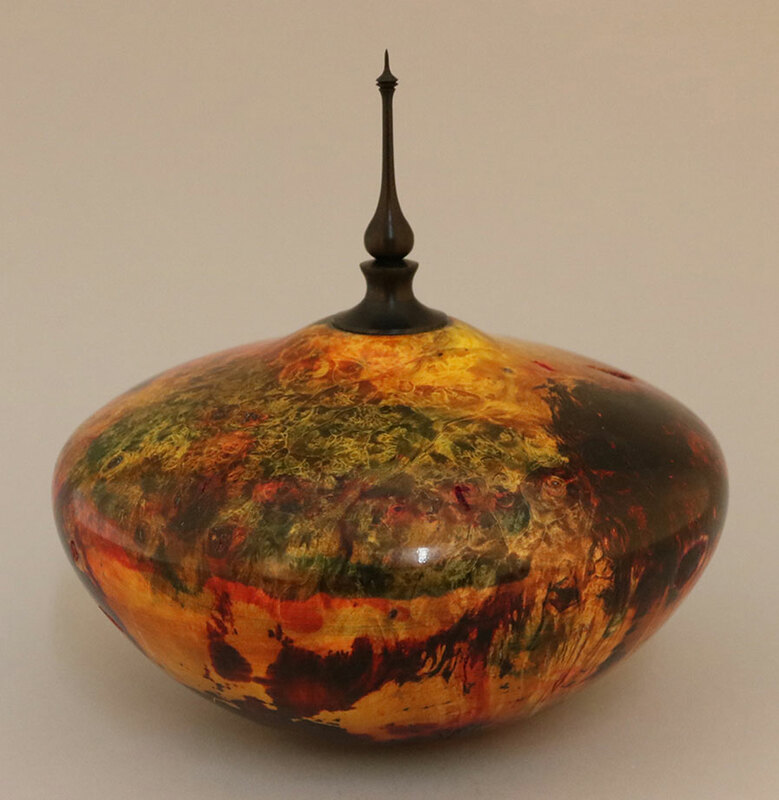 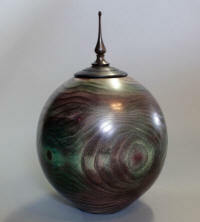 This American Ash urn has been dyed and finished with tongue oil. Volume for this urn is 130-135 cubic inches. If you have any questions please contact me at SamandCheryle@Gmail.com. I began this piece by bleaching the walnut. 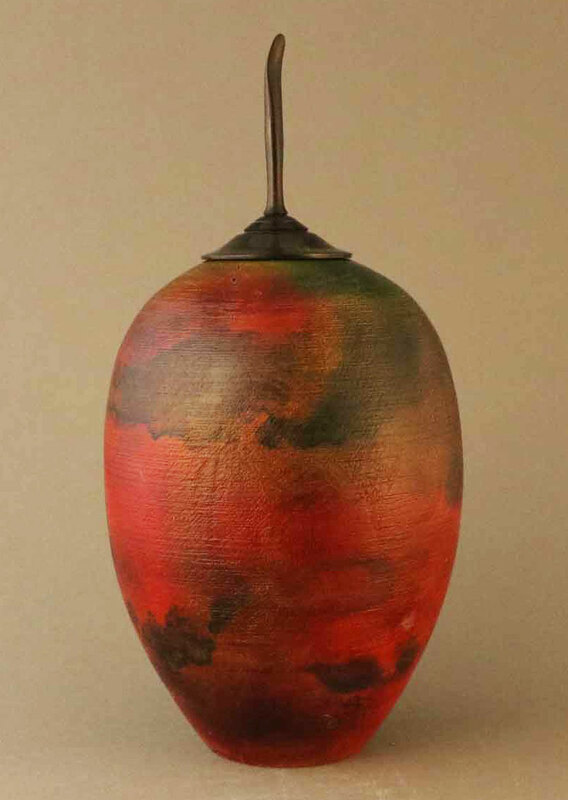 I then wire-brushed the outside and added color to mimic pottery. The finish is a combination of shellac and tung oil. 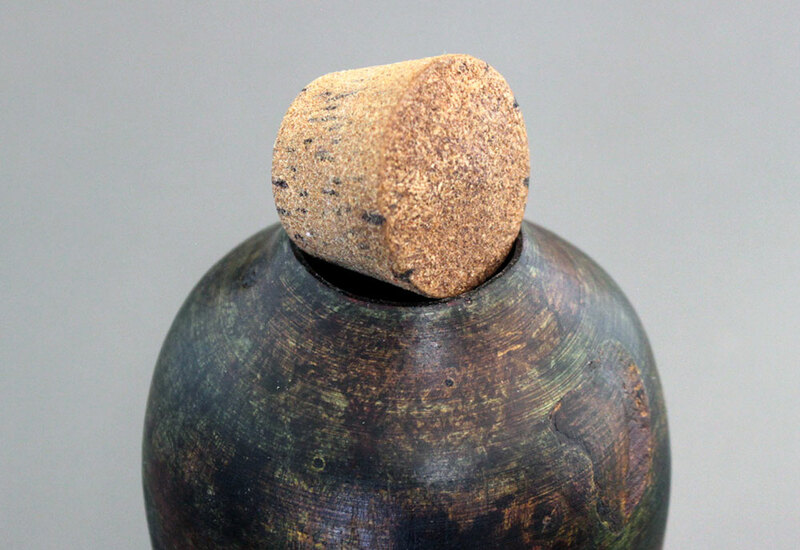 The stopper has been made from wood and finished to look like cork. 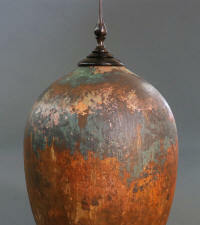 This piece is NOT suitable for a burial urn. 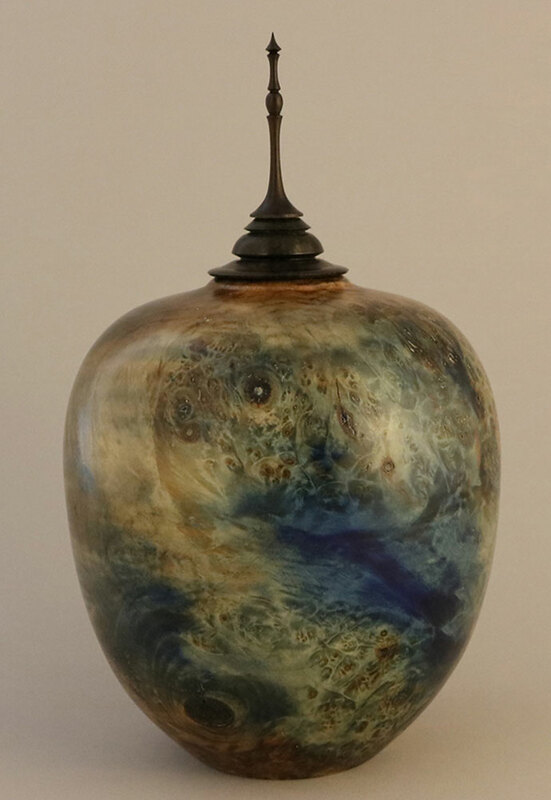 Please visit my ETSY Shop to view many more, smaller burial urns and other decorative pieces available.